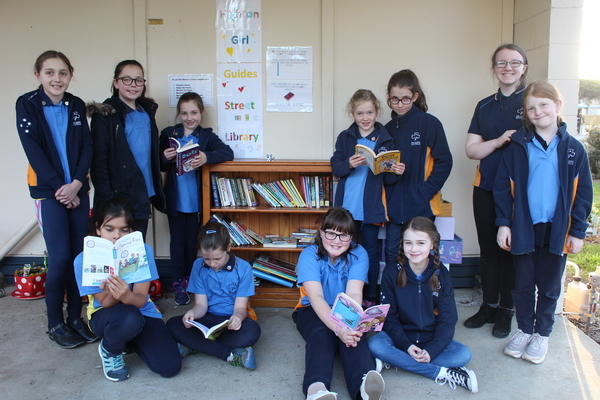 SHHHH: Highton Girl Guides members, standing, Emma, Maddi, Tegan, Breanna, Imogen, Amelia, Kiera, and sitting, Emma, Mia, Charlotte and Charlotte with their street library. A “treasure trove” of forgotten books has inspired local Girl Guides to open their own library. Now the members of the Highton Guides unit are literally taking their venture to the streets after a volunteer discovered the books at the back of a cupboard in the unit’s Patern St hall. The girls had since donated additional books to stock their “street library” on a cleaned-up bookshelf out the front of the hall, a unit spokesperson explained. The group recently achieved registration with Street Libraries Australia to officially operate the “community space” where bookworms could “take, share and give gooks with no fees or library cards”. “The girls are very excited about the new street library,” said Highton Guide leader Jenny Possingham. The initiative impressed eight-year-old Highton guide Isobel. “I love the library,” she said. Girl Guides Victoria says it provides programs helping young members “to get curious about the world and explore everything from volunteering to STEM”. More information about the organisation is available at guidesvic.org.au.